Beautiful car with some blemishes (see photos); missing 1 T-top. 1978 Corvette Pace Car. There is detail that makes this look like the real car! 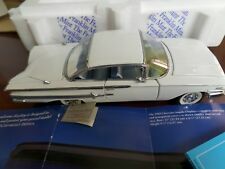 Die Cast Model 1:18 CHEVROLET BEL AIR Concept Cabriolet 2000'S Rare Model! Chevrolet Bel Air. The original boxes are not available. DIE CAST MODEL. SOUTH FLORIDA ESTATE SALE. (No Exceptions). Color Brochure which folds out to 9.75" X 15.75". Franklin Mint. 1:25 scale promo cars. cars and trucks from various manufacturers. 1:43 scale. and trucks from various manufacturers. 1:18 scale. 1:24 scale diecast cars and trucks, paperwork and brochures. Franklin Mint 1969 COPO 427 Chevrolet Camaro Chevy Limited Edition #0690/5000. Mint - Displays like new -. Excellent paint all badges perfect. interior is perfect wonderful detail. Rare Fiberglass. Manufacture - Franklin Mint. Vehicle Make: Corvette. Vehicle Year: 2006. See Last Photo. Scale: 1:24. Franklin Mint 1969 Chevy Camaro Z-28 302 Diecast 1:24 Scale Orange w/ black stripes. This has no box! They are from an adult collection. They are in very good condition but may have nicks or scratches on them. Hawaii, Alaska. 1959 Franklin mint 1/24 scale Chevy corvette. Please look at pics! 1956 Chevy Corvette By Franklin Mint. There is no box. I am not an expert on these cars. They do not have boxes, paperwork or styrofoam. They may be missing parts, antennas, mirrors etc. 1978 Chevrolet Corvette Franklin Mint 1:24 Scale Diecast precision model. Condition is New. Shipped with USPS Priority Mail. This car is in good condition. Not very good, but good. Could use a little shining, but besides the few blemishes, the car looks good. B11D998 Weathered. 1982 Corvette Red and Silver. Rare 1/24 Franklin Mint. 1954 Bel Air. All complete on this uniquely detailed diecast model car with lots of unique features. Manufacture - Franklin Mint. 1946 Chevy Suburban. Manufacture - Franklin Mint. Condition - boxed and clean. 1963 Corvette Sting Ray Split Window Coupe. Rare Fiberglass Edition. There is detail that makes this look like the real car! New Franklin Mint 1/24 1957 Corvette Fuelie Convertible. Franklin Mint 1/24 1969 Chevrolet Camaro Z/28 Limited Edition # 270/2000. Fiberglass Franklin Mint S11G231. Black 1966 Corvette Convertible 427. This 2009 Corvette Z06 Competition Sport - Limited Edition - was done by the Franklin Mint. Done in a 1:24 scale model, and hand assembled from over 120 separate components, and hand finished. This is a NEW, still in the factoy boxes, with paper work, COA. Beautiful piece. you won't be disappointed. Franklin Mint Chevrolet 1955 Bel Air hardtop in 24 Karat gold. New in the box includes all original paperwork. Doors and trunk open. Steering wheel operates front wheels. Steering wheel and tires are rubber. Manufacture - Franklin Mint. Condition - Clean excellent display model. THE 1968 CHEVROLET CORVETTE FROM THE FRANKLIN MINT IS AN AMAZINGLY DETAILED REPLICA OF THE REAL THING! NOTHING MORE AND NOTHING LESS. 1968 FRANKLIN MINT 1:24 DIECAST. CHEVROLET CORVETTE WITH DISPLAY CASE. Manufacture - Franklin Mint. Condition - Clean with no broken or missing parts. Franklin Mint Limited Edition Copper/Cream 1956 Chevrolet Bel-Air. Opening hood, doors and trunk. Scale; 1:24. This car misses nothing in the way of details. Franklin Mint. Partial Paperwork For 1:24 scale diecast cars and trucks, paperwork and brochures. Foldout brochure containing the Car History, Technical Specifications, Certificate of Authenticity. 1:18 scale. This resulted from many years of stacking on the shelves. BUY AT YOUR OWN RISK. Franklin Mint B11G304. Black 2009 Corvette Z06 Sport Competition. This 1999 Police Corvtte was done by the Franklin Mint, Done in a 1:24 scale model, and hand assembled from over 150 separate components, and hand finished. This is a NEW, still in the factoy boxes, with paper work, COA. Franklin Mint 1997 Corvette. Original box, styrofoam, & all papers in photos included. Includes silver colored plaque. Box is in rough condition; writing, minor tears, bends, age stains, etc. Doors open. Franklin Mint 1993 Chevrolet Corvette. Purple in color. Box is in rough condition; writing, minor tears, bends, age stains, etc. Original owners information has been covered up for the photo only; that IS included with the papers. 1969 CHEVROLET CAMARO SS 396 MUSCLE CAR YELLOW CONVERTIBLE FRANKLIN MINT 1:24 DIECAST WITH DISPLAY CASE 2001. CAMARO 1969 SS 396 CONVERTIBLE MUSCLE CAR. REALISTIC DETAILS, YELLOW EXTERIOR WITH MATCHING INTERIOR. This has no box! They are from an adult collection. They are in very good condition but may have nicks or scratches on them. I HAVE ALOT MORE 1/64 CARS AND TRUCKS BY JADA, Muscle Machines, MAISTO, Johnny Lightning, Tonka, Hot Wheels, Matchbox, Ertl, Racing Champions, and many more . This 1968 Corvette Sport Coupe was done by the Franklin Mint. Done in a 1:24 scale model, and hand assembled from over 100 separate components, and hand finished. This is NEW, still in the factoy boxes, with paper work, COA. CHECK OUT PICS FOR CONDITION. 1967 CORVETTE B11XR18 FRANKLIN MINT NEW MINT.